There will come soft rains is a story that has a lot of sci fi elements and uses a nice and entertaining narrative technique. In this blog post I will talk about some of these elements that make this story unique. First I will talk about all of the sci fi features the story has. The first one is that the story is set in the future, 2026, it is a world that has no humans because the nuclear war wiped them out. This is relevant to us because in modern society people are creating things that can be used against us, so we could basically kill ourselves with it, also we are constantly having wars in a lot of different parts of the world. In the story we can see this when they describe the city that is in ashes and filled with radioactive waste. The second sci fi element is the futuristic house that can do anything and everything. The house can cook, talk, prepare baths and control itself. Its relevant because society is inventing things like this and some day we can actually reach to the point like we see in the story. We can get proof of this in the story because it is talking about a house that its alarm is set so it keeps on talking and talking. Now moving on with the Narrative technique part of the story, it is very interesting how the story creates and sets the mood with its unique language. The first technique that can be seen is that there is no dialogue and makes the house the main character. This makes the story more descriptive and unique. This does indeed work to entertain the reader and makes the story special. We can observe the writing and notice no dialogue.The Second technique is that it uses pacing and pauses to set the story's mood. By this the reader can know what will happen next and determine if the writing is good. These were the writing techniques and sci fi elements I found inside the story. Is there alien life out there in the world? Till today in our world we are the only things in the whole planet, but what if there is more to this. One of my questions that is yet to be answered is if there is alien life out in the world or galaxy. This question is very interesting to me because i think that there is certainly more life than us in this huge world full of possibilities, also if we were the only people in this universe it would be a world that is wasted. Also i think that this question is very interesting is because a lot of people want to know the answer. Because of this they start forming their own theories, which by the way are cool and important. There are two possible answers to this question. There is life or there isn't. In ,y opinion I think there is life out there. We cant be the only living things in this enormous world. I think many people agree with me on this, but some don't. I respect those opinions but I would ask for some evidence on this as well as my part of view that needs evidence cant be found. The answer to this question is important because if we found out the world would change a lot. If there is life people would freak out and try to find them, but if there wasn't people would be confused and believers would get sad and the world would change. The answer is important to me because i am extremely curious and want to prove my theory right. For my reading assignment I am reading Percy Jackson and the lightning thief. Until now the book has been really entertaining and full of action, just like the books I like to read. Wow, would be my reaction every time I read a page. This book keeps the reader focused on the book and making the reader wanting to read more and more. Percy Jackson a 15 year old boy that discovers he is a demi god is a perfect character for the book, also the book has some humor in it which makes it a bit more entertaining. Now I will be talking to you about the main problem or conflict we see through out the story. I think the main problem in the book so far is that Zeus, the lightning god thinks that Poseidon's son stole his sacred lightning bolt but really Percy did steal anything from him so that means that he was set up and another god or demi god has the bolt. This leads percy to many problems like Hades minions trying to kill him and making Zeus gain his trust by trying to find the bolt. Percy is a young adventure full character in the story, he also is confused and full of a rebel personality in the begging of the book. An example could be when Percy fought against Anabeth fiercely. This has been my summary on the main conflict so far in the story, leave a comment on your ideas against this. Either yo only live once or you are reincarnated into something else, both reality are terrifying. like the way that there is either a god or not, either way both options are terrifying. 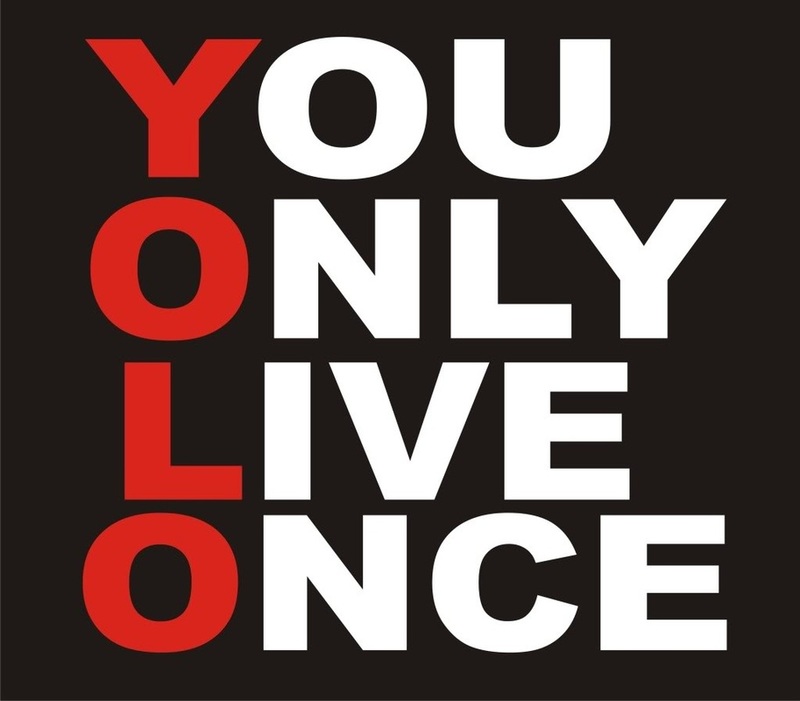 But this is not what I am going to talk about, I am going to talk about the word YOLO. I chose this word for the definition of what I am going to do in 2015. There is many definitions for this word but the main one is you only live once. For me it means much more than this and I will discuss why the word is important to me. This word, Yolo, has changed my way of seeing things, it has made me see that I have to enjoy life as it and live on, be happy for everything and everyone. Also it made me see that i have to do things like if it was my last day, because at any moment something can happy and you wouldn't have lived a good life. For this 2015 year I will propose myself to do this because sometimes I live life a little bit boring and without sense and thats why I think I chose this word for my definition of 2015 for me. I think this is going to be one of the best years because of all of the new things that are coming out and how i will change my lifestyle since I decided to choose this word. I perfered the movie version of the story Romeo and Juliet because it is so creative and entertaining in many ways. In what ways you may ask? Well, the movie version makes the characters in different ways than have seen them before, for example Benvolio is a redhead gangster with a flattop haircut, and Mercutio is a black guy who has a very fighting spirit and is probably gay. This makes the story way more entertaining and the directors are very creative for doing it like this, it captures the viewers atention more than the book. An example of this is that meanwhile in the book they are describing their love towards eachother in so boring ways with to much detail and it just bores the reader. But in the movie Romeo sneaks into Juliets house and then they get scared and they jump in the pool and kiss, this keeps the viewers atention and makes it more interesting than some words. These are some of the reasons of why I perfer the movie version of the story than the book.